An artist's rendering of the new U.S. Consulate under construction in Matamoros, Mexico. 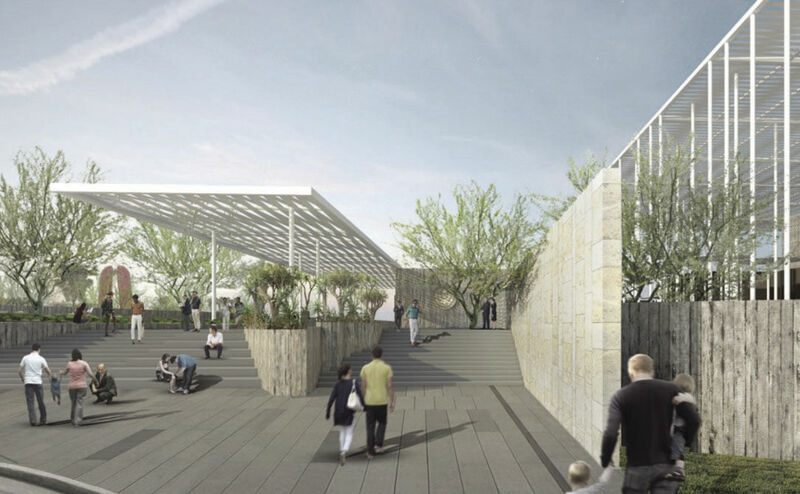 The most expensive building in the Rio Grande Valley region won’t be in Texas. 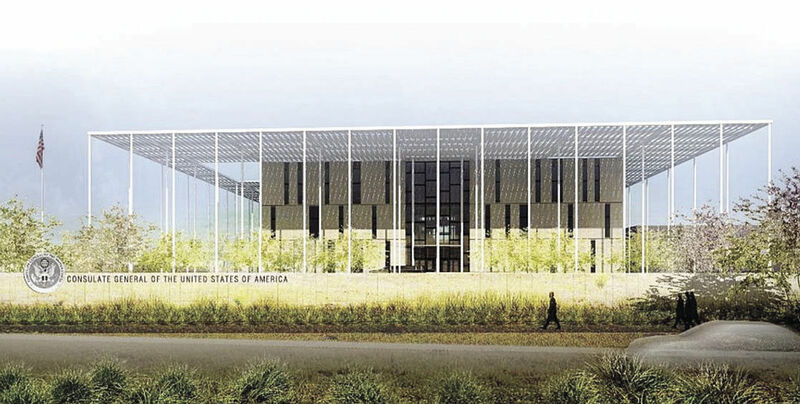 A big convention center, a new arena venue and maybe even a new federal courthouse, which government officials are pushing for, won’t be anywhere near the price tag of the new U.S. Consulate General in Matamoros. Construction has begun on a new $176 million, 7.6-acre consulate site across the border from Brownsville. 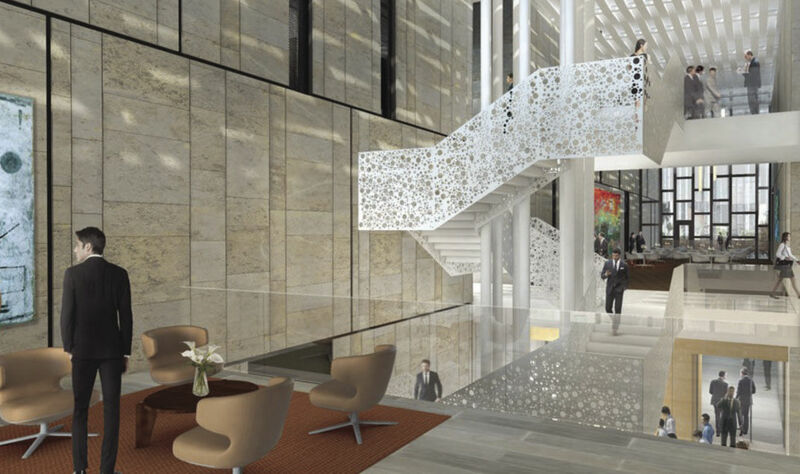 The multi-building campus will include a chancery, Marine security guard residence, support buildings and facilities for the consulate general community. Completion is expected in May 2019. A new federal courthouse has been kicked around, and a federal feasibility study last year laid out the potential cost between $107 million and $110 million. The McAllen Convention Center cost over $60 million, and the new Bert Ogden Arena has held private tours for its $88 million building set to open in Edinburg this summer. But the consulate hasn’t similarly promoted its new venue. Tony Garza, the U.S. Ambassador to Mexico from 2002 to 2009, said this project was in the works during his tenure. And despite some harsh words toward the border, Mexico and Central America from President Donald Trump, this project shows a good relationship between the United States and its southern neighbor, Garza said. Those who study Mexico and bilateral relations see one reason for the new building as a security need. Fulton Armstrong is a fellow at American University’s Center for Latin American Studies, who’s also worked at the State Department, the White House, in the intelligence world and on the Senate Foreign Relations Committee. The need for security based on the consulate’s mission is often the primary driver to rebuild or build a new consulate or embassy, Armstrong said. Every little thing needs to be measured, from how much glass is allowed to the type of glass to the kind of walls to be built. And now, after embassy and consulate tragedies in Africa and the Middle East, new buildings are being built far from the perimeter of the site, he added. Stephen Mumme is a political science professor at Colorado State University focusing on Mexican government and U.S.-Mexico relations. He has spent time at several consulates in Mexico, and has studied the violence. But both Armstrong and Mumme noted the business is likely booming at the Matamoros consulate for visa applications. And because of the busy business, Garza said several U.S. consulates in Mexico could be free-standing embassies anywhere else. “I remember being told that if four of our nine consulates general in Mexico were free-standing embassies they would be amongst our top 10 presences in the world in terms of full-time employees and programs,” Garza said. Matamoros might be the busiest consulate in Mexico, Mumme said. The price tag might scare some, but as the violence continues and more people apply for visas, the American mission in northeast Mexico is critical, they said.